Welcome to Kaleidoscope your source for arts and entertainments created in Wester Hailes by local people! Here is a review of the new film Ben Hur submitted by one of our community reporters. To read more of our reviews by local people click here. 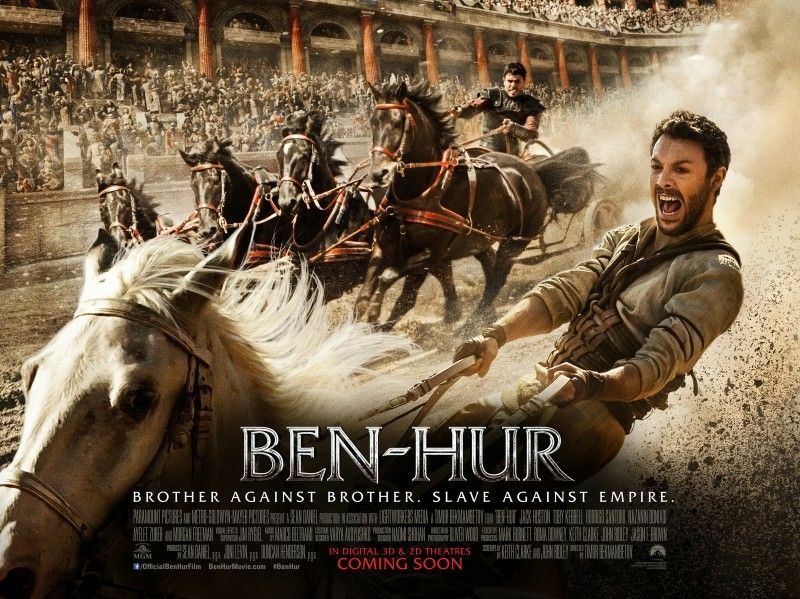 BEN – HUR now showing at Odeon /Plaza. Director: Timur Bekmambetov Starring Jack Huston, Toby Kebbell, Morgan Freeman. In the 1950’s cinema attendance was declining rapidly because most homes now had televisions which became a main source of news and entertainment. I can remember that as kids in Drylaw we went to a neighbour’s house to watch ‘Children’s Hour’ on weekdays. Unfortunately our behaviour deteriorated until one tea-time Mrs Spence’s husband – a Police Constable, arrived home and threw us out permanently. Luckily Brian Mathieson’s mum downstairs (his dad was a Detective Constable because they were Police flats) gave us a reprieve. Our household acquired its first second-hand TV when I was 12. An outing to the cinema was still a special treat if you could afford it – an escape from the domestic prison and a popular dating dalliance. However the mass of people tuned into “Coronation Street” and “Dr Who” and never went back to the cinema again. Hollywood’s secret weapon was the “EPIC” – lavish, Technicolor melodramas with torrid love scenes as well as pitched battles with perhaps an erupting volcano as a bonus. Huge budgets were invested in large-scale productions with “a cast of thousands” (the Spanish Army). Examples are BEN HUR (1954), EL CID, QUO VADIS, THE LONGEST DAY, and later – CLEOPATRA, LAWRENCE OF ARABIA, SPARTACUS and DR ZHIVAGO (here the Spanish Army played both White Russian and Red Army forces with snowy Moscow recreated in a Madrid film studio). Spain and Italy offered good weather for filming, use of their armies as extras and state of the art film studios. Last, but not least, these proceedings were headed up by the likes of Elizabeth Taylor, Richard Burton and Victor Mature. These epics attracted many back to their local cinemas. They were very long so an Interval was part of the show – giving the cinema a captive mass of thirsty famished people who would buy soft drinks, ice cream and hot dogs. I enjoyed the new BEN-HUR movie a lot. It’s what was called a ‘Sword and Sandal’ epic – set in ancient times, often a morally uplifting Bible story but with plenty of sword-fights and love interests (the Bible Lands are a hot climate which was an excuse for the female cast to prance around in comfortable negligees). Cinematography has advanced technically since those golden years, images can be tweaked to maximum effect using the computer, and sound recording has made leaps forward which adds a lot to the ‘soundscape’ of BEN-HUR , especially in the Chariot Race. These technical improvements allow total overwhelming chaos and pandemonium to be unleashed in the climactic Chariot Race! JACK HUSTON is totally different from his “grandaddy” version Charlton Heston. He is a Cool ‘New Man’ with a sense of humour that the earnest Heston lacked. Also Ben’s foster brother Messala, (TOBY KEBBELL) in the earlier movie a dark and cruel nasty-man, is here painted as more thoughtful and tormented with a guilty conscience over the reprisals he is ordered to inflict on the Judeans (he serves as a Roman Centurion). This actually leads to a surprising and uplifting ending to the movie. PONTIUS PILATE has some scenes in the story. This is a dream role for actors – a few Pilates who have washed their hands of the annoying Man from Galilee include Rod Steiger, Christopher Plummer, David Bowie and – my personal favourite, an unknown Italian actor who plays Pilate in Mel Gibson’s The Passion of The Christ. He speaks in Latin which adds to the drama, “Quid est Veritas?” he asks Jesus. But BEN-HUR’s Pilate is bland and a flop. If you have recently seen a film, play, TV show or read an interesting book and are interested in writing a review, we need you! For more information you can contact us on digitalsentinel@whalearts.co.uk or 0131 458 3267.